This site provides an online home for all alternative-minded people who have become proficient at developing their own expertise & now seek community with like-minded others. Our purpose is to consolidate the alternative to business as usual by assimilating all the various design elements and other essential strands that so many scattered folk have originated since the 1960s. Understanding that business as usual is destroying nature, threatening our survival, and that we are all in transition toward the alternative, is now widespread. In this transitional era the danger of social collapse is looming. To avoid ending up in chaos & anarchy we need an alternative plan. Mainstreamers will cling to business as usual until it fails, being unable to imagine an alternative. Only those of us who have spent a lifetime developing alternatives can provide that! Individualism has created a culture of everyone doing their own thing but now we must converge our aspirations into a common cause to engage the challenge of collective survival beyond capitalism. So let's build ourselves a supportive online network, to be our communal context, and put us all on the same page. Group process here will link members on a common aspiration & skill-set basis, so that mutual agreement on enterprise and projects emerges naturally from the plan. Projects will originate as designs which can be distributed as templates but must be seen to have potential practical application in order to provide genuine mutual value. This is a dual-purpose site: one focus is on the global context - we outline a collective survival strategy. 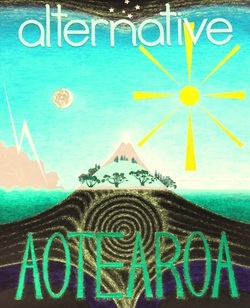 The other focus is on Aotearoa (New Zealand) - providing an online venue for everyone outside the mainstream to work together on a better way forward. Our primary purpose is to coordinate alternative folk, provide a communal voice and focus on solving collective problems for those who seek to create a better world. Getting it right is essential from now on: we currently face several global threats to the survival of the human race. The following pages develop a suitable model for both global & local collaboration. Our secondary purpose is to form a political movement unlike any other to provide representation in politics, media & culture, for the various alternative constituencies in Aotearoa hitherto unrepresented. The design is replicable elsewhere: readers in foreign countries may find it suitable for fulfillment of their aspirations. We intend to present and advocate better options for collective decision-making. Teamwork is essential: we will outline a suitable model. We seek to recruit members who are ready, willing & able to serve as exemplars of alternative community-building, networking, organising & problem-solving. We particularly value those good at achieving consensus, those who see the common ground as well as the big picture, lateral-thinkers and those with a flair for creative design. The scenario page develops our plan to help you see how relevant it is to your life. Success in this venture depends on the viral nature of the designs and natural resonance between participants - particularly when the essential links are formed to both existing online networks and local communities. The sense of a viable alternative to business as usual will snowball when the lateral thinkers in the wider community catch on and operate as opinion-leaders (a preliminary sketch of the design elements of a post-capitalist economy are provided on its adjacent page). Join the movement by filling in our contact form - which you will find on the network page! We need a real sense of community here. Site functionality must facilitate interaction between members so that distant folk get a sense of the humanity of others in foreign cultures; feedback to improve that is welcome. The seven primary pages link to secondary pages (you'll see the link when your cursor is over the page name). The site designer has an editorial linked to this page (currently a critique of the green movement). Designer's note: The 7th page above is my blog. The site will evolve from feedback & what's necessary for success. My intention here is to serve the common interest, which requires a genuine basis of like-mindedness - as verified by those who join the movement. If you resonate with both concept & design sufficiently to feel it is worthy of your support, do let me know and feel free to copy the content to a clone site for further development if you are so motivated. [If you do, please include a footnote that credits me for the basic concept & design.] Authentic recruits to our common cause are vital to the success of this endeavour so I will be keen to liaise with volunteers depending on my available time. Please specify your focus (global, as a node in the envisaged network, or local to this country).